I may not write a book review for every book I read, but I felt especially compelled to write about this one. Long story short, All the Bright Places moved me. It’s changed my perspective on life, and at some parts, I was able to relate to the story. Never before had I read a book that made me tear up, and want to bawl, while reading in a crowded subway car. Not even ACOMAF (I saved the tears for when I got home). Constant tears welled up in my eyes, and blurred my vision as I read through the last hundred pages of this beautifully written tale. But enough rambling about my reading experience, let’s get into the parts that made All the Bright Places so emotionally wrecking. This is the story of Finch and Violet. Finch is a boy who thinks of suicide on a daily basis, yet wants to keep living. Violet is a girl who started considering suicide after a tragedy. The two meet unconventionally, and a sort of unreciprocated romance develops. Finch becomes obsessed with her, while Violet takes some time to reciprocate Finch’s love. But eventually they find each other, and their story is absolutely heart breaking. And I mean you’re gonna want to prepare a few boxes of Kleenex for this read. I loved Finch and Violet’s wanderings. Their post-it notes. Their Facebook messages. All the Bright Places is a love story, that has that warm TFIOS feeling, but an ending uniquely it’s own. I can’t tell you the exact page when I fell in love with Finch, and consequently the story, but it was definitely within the first twenty pages. And I’ll be honest in this part of the review-and this is difficult to talk about, but I related to many of Finch’s inner thoughts. When Finch described being Asleep, I thought back to the times when I was physically alive, but felt dead and empty on the inside. When Finch talked about not mattering in this world, I remembered the times when I was alone in my thoughts, and didn’t think anyone would remember me if I simply disappeared, though suicide was never a thought that I fathomed. Regardless, Finch had insecurities and numerous flaws, and he was the first character I read about that reminded me of myself. He was a relatable character who opened my eyes to the gravity of suicide and the power of actually living your life. So even though this story has utterly destroyed me, it's also made me stronger as a person. Jennifer Niven has inspired me to go out, and explore-to go out and wander. And having lived in New York City for nearly my entire life, it's occurred to me- for the first time- that there are so many hidden gems left to be seen in this bustling city and that I've taken so much of this special place on Earth for granted for the past decade. And NYC is special with its own secrets, but even if you don't live in a large metropolis, All The Bright Places shows you that there’s beauty everywhere you go, even in the quietest of towns; you just need to be willing to find that whimsy. 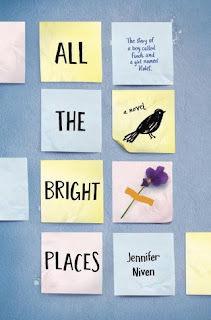 Whether you’re able to connect to this book personally, or are looking for a rather short, fast paced contemporary, I highly suggest All The Bright Places. I finally picked up this book (after being spoiled a year ago) since many of my non-reader friends became obsessed with it (one of them even reread the book three times). But if the topic of suicide is something you would prefer not to read about, that’s okay too. I know that for me, I had put off this book for so long because it dealt with suicide and insecurities and I was afraid to read it, and I regret that decision now. Finch and Violet go on the most incredible adventures, taking you along for the ride. The humor in this story is spot on, and Finch, ya gotta love Finch. So please, I encourage to pick up this book, and give it a try, it might end up being your favorite book of all time. I absolutely loved this book. And it's so amazing that it moved you so much! It definitely has that ability. Have you read Holding Up the Universe yet ? Not yet, but it definitely a book I need to get my hands on! This was my first Jennifer Niven book, but I doubt it'll be my last. Have you read it? Wonderful review! I read this a couple years ago and was just as moved as you were. I 100% sobbed at the end. I'm so glad you feel just as strongly about it! I read Holding Up the Universe a couple weeks ago and while it is not as emotional as All the Bright Places, it is still beautiful and fun! Thank you! I'll definitely make sure to check out Holding Up the Universe when I get the chance. I've fallen in love with the beauty of Jennifer Niven's YA writing! I'm so glad you liked this one! I loved Holding Up the Universe. I'll definitely have to give this one a read! This book had been on my list of books to read for a while before I finally picked it up and read it. I was definitely not disappointed! Such a beautifully told story.